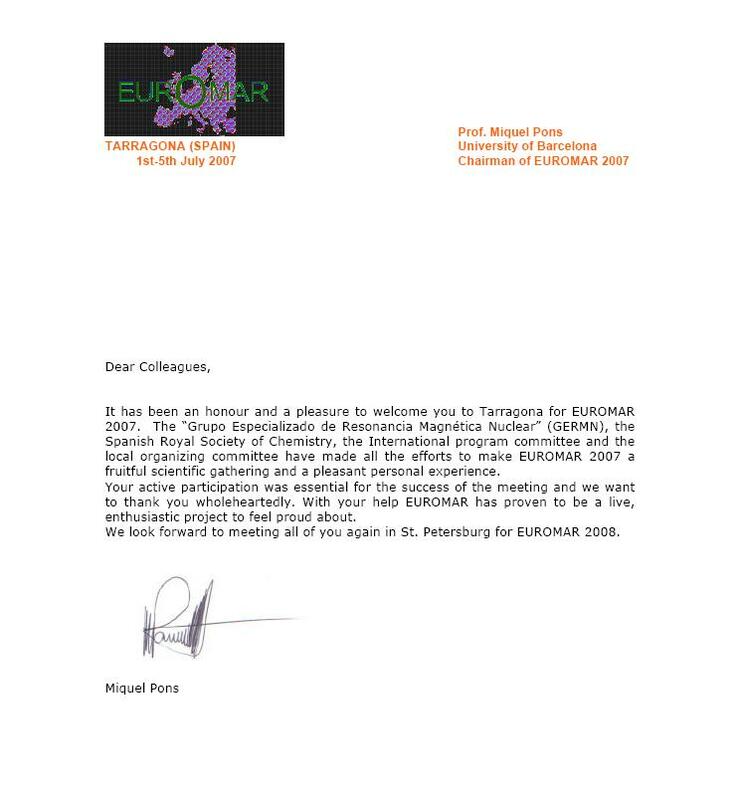 Thank you for your interest and participation in the Euromar 2007 International Conference that will be held from 1st to 6th July 2007 in Tarragona. We kindly request you check that the above services are in order. Any changes or cancellations should be addressed to euromar2007@viajesiberia.com in writing. We look forward to welcoming you to Tarragona and wish you a pleasant trip and nice stay. "Itinerary as below stands cancelled:"
When the shape of a magnetized material is a non-spheroid, the bulk susceptibility-induced field distribution is inhomogeneous within the medium. However if the shape is a regular shape, even if non-spheroid, then it has been noted that an inner volume element of shape similar to the external macroscopic shape within which a special position can be found such that at that point the induced field from the external bulk can be zero1. This situation was remarked to be similar to the case of spherical inner and outer shapes. In the case of the spherical shape, this situation of zero induced fields within the IVE turned out to be advantageous for HR PMR measurement of chemical shift tensor parameters because of the convergence characteristics2 of discretely summed intermolecular contributions to induced field at the centre of IVE. But in the case of non-spheroid regular shapes, the zero induced field positions need not be the central pints within the IVEs described. Then, it becomes imperative to find out the convergence characteristics of discrete summations to enable the possibility of applying a correction. Such consideration would make it possible to envisage a protocol of procedure to extract the intra molecular Shielding Tensor Parameters of Protons in organic molecular single crystal by the HR PMR techniques in solids. 1. a) http://nehuacin.tripod.com/id3.html Sheet-11of the poster at 4th Alpine Conference on SSNMR, held at Chamonix Mont Blanc, France; Sept. 11-15, 2005.
b) http://nehuacin.tripod.com/id1.html Sheets 18 and 19 of the Poster presentation at the EUROMAR2006, held at York University, York, UK; July, 16-21, 2006. 2. http://nehuacin.tripod.com/id3.html [same as Ref. 1.a) above] Sheets 6-8 of the same poster. Dr.S.Aravamudhan intends took part and presented a POSTER at the 2nd Midyear Meeting of the CRSI at the IIT Guwahati on 21st July 2007.